Performance and Technical information on basic modifications to a stock Harley-Davidson Twin Cam motorcycle engine with a CV carburetor. One of the first things most people do shortly after they get their new motorcycle is start to modify the engine. In the time honor tradition of Harley-Davidson, the first thing to go on most bikes are the stock mufflers in an effort to improve the sound. This is usually the first in a long list of changes to the engine. Changes to the carburetor and ignition system also rank very high on the first to change list. These changes are done to improve the performance of the bike. There are many companies out there that are competing for the dollars that Harley owners are willing to spend on their bikes. As an owner, you will be bombarded with a vast array of promises, claims and inaccuracies in an effort to get your money. Reading between the lines on many of the performance claims can be bewildering. 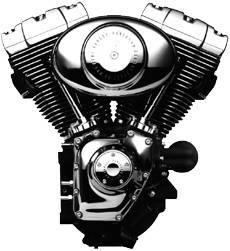 Does the Harley-Davidson world need another stock engine modification article? I decided it does, since the results obtained by the engine upgrades listed here provided significantly better results than those documented by the popular magazines aimed at the V-Twin crowd. Stage One engines involve no internal changes to the engine. All modifications are made by bolt-on changes to external components on the engine. These components include air cleaners, carburetors, exhaust systems and ignition systems. No special tools or training is required to perform these modifications, although it is recommended you are comfortable working on your own motorcycle. Over the past several years we have installed and tested many manufacturers components. The list of parts used in building the ultimate 'bolt-on parts' engine is the end result of this testing. The best and least expensive of the individual components was selected and tested as a single package. The fact that virtually all the parts used for the project are from Harley-Davidson is a coincidence. There was no plan or idea to use mostly Screamin' Eagle parts for this project. All the parts used are readily available through your Harley-Davidson Dealer except for the spark plug wires, which can be ordered directly through Magnecor. No special tuning was performed to achieve the results listed. All components were installed according to the manufacturer instructions supplied. The results of the Dyno testing verified the improvements. The test results showed the engine was now producing 69 horsepower and 79 ft. lbs. of torque. This represents a 10 HP improvement over the stock power of 59 horsepower and 72 ft. lbs. of torque. The good results are due to a well matched set of parts being bolted-on to the engine. Seems that a little of that money the Dealers send back to Milwaukee is going into engine performance research. The ability to create the same results with other manufacturers parts is a distinct possibility. Many optional parts should perform as well as the parts tested as long as you avoid drag pipes. Please be aware that your results may vary and other parts may not perform as well as the components tested listed. Still not enough power for your needs? We decided to find out what happens when you take the Ultimate Stock Engine and make it a Stage 2 bike. There are more surprises ahead as we continue to step up the power in our "Ultimate Engine" modifications series of articles. The Horsepower Gallery provides an extensive list of bikes , the power they produced and the major engine components.